Please contact your Partner at GOWLING WLG for details to attend by invite. The Canadian Council for the Americas and The Latin American Research Centre with the support of Gowling WLG, our Host Partner, invite you to join us for a conversation with Senator JOSE MIGUEL INSULZA, Former Secretary General of the Organization of American States (OAS). 2018 is an important electoral year in Latin America where many countries hosted elections with potential opportunities and repercussions for Canadian businesses. So far, elections have happened in Colombia, Costa Rica, Cuba, El Salvador, Mexico, Paraguay, and the upcoming in Brazil. Come to hear what Senator Insulza's perspective on what to expect from each election. A lawyer by profession, he has a law degree from the University of Chile, did postgraduate studies at the Latin American Social Sciences Faculty (FLACSO), and has a master’s in political science from the University of Michigan. Until 1973, he was Professor of Political Theory at the University of Chile and of Political Science at Chile’s Catholic University. He also served, until that year, as Political Advisor to the Chilean Ministry of Foreign Affairs and Director of the Diplomatic Academy of Chile. He became involved in politics during his student years and served as Vice President of the Student Association of the University of Chile (FECH), President of the Center for Law Students of the University of Chile and President of the Chilean National Union of Students of University Federations of Chile (UFUCH). In the early 1970s, Insulza played an active role in Salvador Allende’s Popular Unity government and, following the coup that brought General Augusto Pinochet into power, he went into exile for 15 years, first in Rome (1974-1980) and then in Mexico (1981-1988). In Mexico City, he was a researcher and then Director of the United States Studies Institute in the Center for Economic Research and Teaching (CIDE). He also taught at Mexico’s National Autonomous University, the Ibero-American University, and the Diplomatic Studies Institute. Insulza was able to return to Chile in early 1988 and joined the Coalition of Parties for Democracy, the coalition that won the plebiscite against the Pinochet regime in October of that year. He has held numerous high-level posts in several Coalition governments. During the administration of President Patricio Aylwin, Insulza served as Chilean Ambassador for International Cooperation, Director of Multilateral Economic Affairs at the Ministry of Foreign Affairs and Vice President of the International Cooperation Agency. In March 1994, under the administration of President Eduardo Frei, Insulza was named Under-Secretary of Foreign Affairs and in September of that year was appointed Minister of Foreign Affairs. In 1999-2000, he became Minister Secretary General of the Presidency. 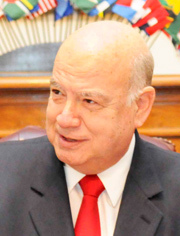 In March 2000, under President Ricardo Lagos, he was designated Minister of the Interior and, as such, filled the office of Vice President of the Republic. When he left that post in May 2005, he had served as a government minister for more than a decade, the longest continuous tenure for a minister in Chilean history. Insulza is married to Georgina Núñez Reyes. He has a daughter (Francisca), two sons (Javier and Daniel) and seven granddaughters.